Are you interested in learning Chinese? We know how languages can open opportunities to broaden our horizons. Foreign languages can’t be learned by oneself so rapidly, its got to be learned step by step with some professional help. I have been trained in a teaching course for foreigners, and can tailor this course for you particular needs interests and pace. Hi! My name is Smile Lin. I am a native Chinese speaker from Taiwan. I love travelling, so I learnt some intermediate English and Japanese to aid in exploring this world. My teaching motto is “As we learn more languages, it open doors and we find this world more amazing”. Life is short, it should be more interesting! Welcome to my class, I will make sure you have a great experience. Specialist in Traditional/Simplify. Business and Conversational Chinese. Taiwan. Taiwanese and Mandarin are my native language. I was the Bachelor of Arts degree on 2003 in the Christian Chung Deh College in Taipei, Taiwan. During the time I also have successfully completed Teaching Chinese as a Second Language program in language center of National Taiwan University in Taipei, Taiwan. I had traveled several times in the Unite State and some countries in Europe for my holiday. I was living in Germany as a housewife for 7 years. Then, I have been working as manager in sale of real estate in Taiwan. Some of my life experience, its might help your Chinese learning, especially for business and live session Chinese. I am sure that you will fun to learn from my class, no matters which lever you are right now. Most important are you will got what you need and what you want to learn via my interesting way to learn. It should be practical and convenient for you online meeting and learning. I will maintain our focus on the main goal, than you can achieve it. I’d like to help you learn Mandarin, the language that is beautiful and colorful! I value what you think about the course and how you’d like to be assisted, and then I will arrange the course appropriately for you. I will do my best to answer any questions you have while learning Mandarin and provide opportunities for you to practice this language. I’d be glad to suggest various kinds of materials for cultural learning as well. 아름답고 재미있는 언어, 중국어를 함께 배워 봅시다! 저는 수업 에 대한 학습자의 생각이 중요하다고 생각해요, 그래서 그 생각 에 따라 수업 내용이 정해질 겁니다. 언제든지 중국어에 관한 질문 이 있으시면 질문해 주세요. 제가 최선을 다해서 도움을 드릴 뿐만 아니라 언어를 연습할 수 있는 기회와 문화 감상을 하기 위한 다양 한 자료도 제공하겠습니다. I have lived in Taipei for 15 years and was in Australia for a 1 year work-holiday. Previously, I worked as an interior designer, but began teaching Chinese 3 years ago after I obtained my TCSOL and EDI certifications. I have had more than 800 hrs of teaching experience primarily with low to intermediate level students. I am reasonably well-informed about many business issues and have the ability to help with student problems in a humorous and thoughtful manner. I understand when pupils are in need of help and feel that I can serve you well as a Chinese instructor. I have taught Mandarin for more than five years to students from all backgrounds. I have excellent standard pronunciation free from dialect I explain how usages difference between Chinese regions to equip my students for all Chinese speaking regions. My teaching resources provide give my students a strong base for practical daily needs, I also give an insight into the culture and history which lie beneath the Chinese. I've been working for a Mandarin Center of an university as a Mandarin teacher. I have a TCSOL and TOEIC gold certificate. I can help you to learn Mandarin efficiently, I am a facilitator, prompter, organizer and resource for learners. I place more responsibility on learners to take the initiative to meet the demands of various learning tasks. I have a warm and out-going personality. Let your language journey begin with me! I am experienced in nursing profession and have a Master’s in Health Management. After receiving the training courses on both " Teaching “Chinese to speakers of Other Languages” and “ Teaching Chinese to Young Learners” from IHI, I have been teaching Chinese for two years and I currently is a Chinese teacher at university as well as a private tutor. I'm very committed to solving students' problems in learning Chinese. Hi there ! 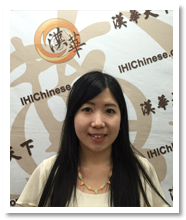 my name is Yu-Jing Shu.I have been teaching Mandarin for four years. 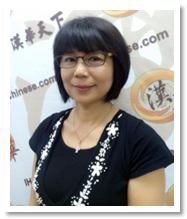 I am well-experienced in helping adult Mandarin learners to speak the language with the easiest and the most fun way. Welcome to the class and I’m looking forward to having joyful learning with you. I’m very passionate about languages, I've always been interested In the study of language acquisition and its relation with cross-cultural intertextuality by virtue of multimedia.My career goes all the way back to the years in France while pursuing my studies there as a graduate student of liberal arts. I offer tailor-madecourses for learners from beginner and introductory level to intermediate and advanced level covering grammar analysis, essay writing and lecture in Journalistic Chinese. I have been teaching Chinese for four years and I’m teaching Chinese for the group class in the MingChuan university. My class is always full of joy and I always give students a very interesting class . I am a patient and passionate teacher. If you want to take a Chinese class, please choose me and you will never regret. I hope you enjoy the class and learn a lot Chinese from me. And I can make your Chinese improve and progress as fast as you want. Enjoy my class ! I love teaching Chinese, especially good at business Mandarin and young learners. I am a graduate of education and honored to be the G20 (2014) scholar at Griffith University. I am a pre-service Chinese teacher(with 224-hr expierence) in St Paul's School and a part-time online Chinese teacher in Brisbane. I got the cerificates in TCSOL, TCFL and the First Class Lower grade of Putonghua Proficiency Test. No matter you are interested in China, Taiwan or Hong Kong, I can communicate with you fluently. It’s my honor that my students would like to learn Chinese with me! I studied ´´Teaching Chinese as the foreign language’’ for 3 years in the Fu-Jen Catholic University. I speak German (C2) and English (C1) fluently as well as obtained some international certificates, such as ‘’ TCSOL’’, ‘’TCFL ’’, ‘’PSC’’, ‘’IELTS’’, ‘’DSH’’ (German Language Examination for the Joint University ). In addition, I have been teaching Mandarin Chinese in the Language Centre and International Student Centre of the FJU for 2 years (2012-2014). I believe deeply that you will enjoy my Chinese culture and language adventure ! My name is Yu-Fang Chang. I am a bilingual (English and Chinese) teacher and good at proficiency in both traditional and simplified Chinese, efficiently help second language learners achieve their goals. Specialized in vivacious activities and interactive teaching, to the practical of the useful rules learning. I am welcome to invite you join the class with me. 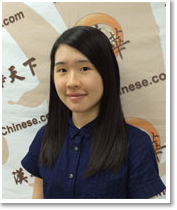 Hello, I’m Chang Shu-Mi, I am a Chinese native speaker and I have the license of TCSOL, for me, “the one who practices learns”, so in my class, I would like to use interactive teaching methods and lots of interesting drills to make you learn and improve. Gradually, you would find out that Chinese is so interesting, you can learn it, say it, and even produce it, and finally acquire this language. I’m a passionate and responsible teacher, so if you have any questions of learning Chinese,I am willing to help you at class! Go! My name is Hsiang-Ju Huang. I am qualified with TCSOL, EDI, ICLT and TCYL certificate, I have15 years teaching experience at Kindergarten in Taiwan. As a private tutor, I am very excited about teaching Chinese. The most important thing is help student build up own ability to learn new language. I aim for my class to be a place of fun and learning, so that I will design something creative and unique into each class for a great learning experience. I believe that it can help you learn in creative and efficient. Hello, my name is Joanna and I currently live in France. I came to France for my postgraduate study of business management 4 years ago, and then I started to work and settle down here. I got the license, TCSOL ,of teaching Chinese and I have the experience for teaching my mother tongue (both traditional and simplified) to native English and French speakers for 4 years during my casual time in France. My method of teaching Chinese is with more practices and exercises in the class as well as sharing the culture with my students. I hope you will enjoy learning Chinese while exchanging cultures in my class. See you soon on IHIChinese and have a good day! My name is Fei-Fang, Zheng. I live in Japan. I am very excited about teaching Chinese. I got the license, TCSOL of teaching Chinese and I have the experience for teaching Chinese ant society. The most of my students are married woman and child, because there family works in China and Taiwan. I am interested at learning languages, especially my mother tongue Chinese. I am looking forward to exploring the beautiful and mysterious Chinese. Hello guys, I am Shao-Chien Chen. I got two certifications, one is TCSOL and another is TCYL. To me, teaching Chinese is a profound and beautiful experience. I believe as a Chinese teacher, have enthusiasm is basic but not enough. Teaching Chinese is not only teaching student how to speak and understand Chinese but also sharing Chinese culture, teacher’s insight and life experience with student to make them into learning and love Chinese.Hope we can share our culture together through the net. See you there! Hi there! My name is Kate. I’ve been an ESL instructor in the States for years teaching English and helping international students here to learn the language and explore the cultures embedded. I am also well experienced in teaching Chinese! All in all, I am very passionate in teaching languages and sharing all sorts of cultural experiences with my students. I see myself as an energetic, interesting yet very patient teacher! I can assure you that learning Chinese with me is an enjoyable yet effective experience with noticeable outcomes! I am especially good at tailoring the lessons to meet the specific needs of yours. Trust me, you are in good hands. Don’t be shy and get ready to kick off a fantastic Chinese learning journey with me! Hello my name is Ting Lan Kuo( Tina ), I’m a qualified tutor of TCSOL, and I can teach both traditional and Simplified Chinese, I lived in Canada 2 years and UK for 7 years, at the moment I live in France, I have business management background, so while the time we’re learning Chinese we can also share the culture and experience together. The first thing I would like my student to know when learning Chinese language is to be patient and always be positive. If we have to start from the beginning then we will learn step by step, don’t be afraid, because “ I” can totally understand the feeling of learning a language since I had to learn English, So don’t worry, I’m a patient tutor, just hope my student will enjoy learning Chinese with me. My high school education took place in New Zealand; I went there all by myself when I was 13, and where there I spent five years and fell deeply in love with children’s English literature. I later obtained a TESOL degree from Taiwan Adventist College in 2001. After college, my first job was working as a Guest Relations Officer in Splendor Hotel (former Grand Formosa Hotel) in Taichung, but I still loved working with children. So then I sought an interesting but yet challenging job, that was teaching children English. Including my studenthood, I have taught English for four years and still loving it. I love bringing new knowledge to children, to tell stories to them, and to cheer for them when they made even the slightest achievement. Hi there, My name is Wu Wan-Ju. I hold the following certificates TCSOL, EDI and TCYL. I am qualified to teach both Traditional and Simplified Chinese. My ethos is "the one who practices, learns", In my class I use interactive teaching methods and lots of interesting drills to enable students to learn and improve their knowledge and skills of the language in a much more interesting and fun loving fashion . Gradually the student will grasp a deeper understanding of probably one of the most interesting languages in the world today and finally will not only be able to listen but also to speak, read and write this language, I will be only to pleased to answer any questions that you may have concerning the learning of Mandarin so please join my class and see for yourself the joy of learning. Hello, I am Anna, because of my job, I have been doing business around the word in Europe, and other Asian countries for 7 years. That's why I realize there are more and more people who want to learn Chinese. And for this reason, I started to devote myself in teaching Chinese by using the languages that I spoke such as English, Japanese and French. Hope there is a chance to become your teacher.